How to Make Partition in Windows 7 / 8 / 10? Position: How Tos - Partition Management - How to Make Partition in Windows 7 / 8 / 10? How to make partition in Windows 7, Windows 8 and Windows 10? In this guide you can find three ways of creating partitions in Windows 7/8/10. DiskGenius is free partition manager software and it is able to make partition on current partition or resize partition without losing data. DiskGenius - Free partition manager to create, delete, format, resize, extend, clone or image partition. How to make partition in Windows 7/8/10? What is a partition? A partition is created on storage devices such as hard drive or USB drives, and it contains a period of contiguous disk space. Windows manages partitions separately and assigns a unique drive letter for each partition except for hidden partition. A single disk can be partitioned into one or multiple partitions. Partitions are able to separate Windows operating system from other data if you install system on a separated drive. You can create backup for each partition to protect data against data loss or damage. If one partition gets corrupted, files stored on other partitions won’t be disturbed. Thus, partition your storage device is an effective method to manage data, system or software, especially when your disk has very large capacity. Since disk partitioning has so many benefits, the first thing to be done after installing a new disk is to partition it. This means you need to create one or more partitions based on your needs. Fortunately, it is quite easy and straightforward to partition a disk. 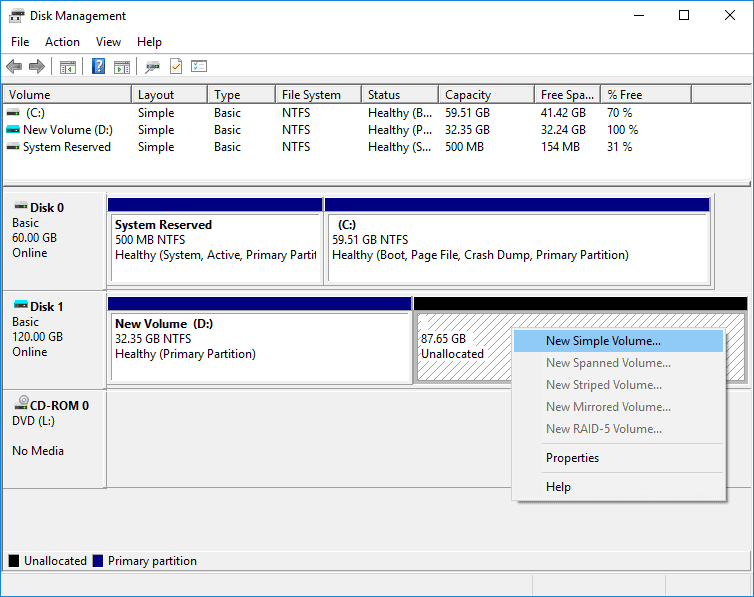 This guide will show you how to make partitions in Windows 7, Windows 8 and Windows 10 via multiple methods. It sounds like a complicated thing to make partitions in Windows, don’t worry, creating partition is very quick and easy. We’ll present three methods to help you make partition on hard drive: Disk Management, DiskPart command and third-party partition manager software. Disk Management: It is a Windows built-in bool and it becomes quite powerful since Windows 7. It enables you do many basic operations on partition, such as create, delete or format partition. Besides, you can also perform some advanced tasks like attach VHDs, convert to dynamic / basic disk, etc. As to making partition, it is able to create new partition from unallocated / free disk space and process is easy to follow. DiskPart: It is powerful command line utility in Windows. It is a set of commands ran in Command Prompt and it is started by tying "diskpart" in Command Prompt, after which you can continue to type other commands to mange disk and partition. It is also able to manage disk and volumes with features that are not available in Disk Management. DiskPart is more suitable for advanced users, as it is not that easy to use. You need to make sure commands are done to correct drive in case of data loss. Third-party partition manager software: This can be the best solution to manage disk space and partitions. It is effective and intuitive to use, for instance DiskGenius. DiskGenius is free partition manager software and it includes all features that Disk Management can do, and it also provides many advanced functions such as split partition, convert primary/logical partition, convert GPT/MBR or convert dynamic to basic disk without data loss, clone partition, image disk, wipe hard drive, etc. Note: Steps and screenshots in this guide are made from Windows 10 system, but the process in Windows 7 and 8 in much the same. Step 1 Launch Disk Management. The easiest way to open Disk Management is right-clicking Start button and selecting Disk Management. Another way to launch it is typing "partition" in searching box and selecting "Create and format hard disk partitions". Step 2 Find out and right-click on Unallocated (Free) disk space and select New Simple Volume option. If no free space is available on your hard drive and you still want to make partition on the disk, you’ll have to either shrink a partition or delete existing partition to get free space. However, deleting partition will removes all data on it and you need to back up data in advance. Alternatively, you can use DiskGenius to complete the task, as it is able to create new partition from existing partition without data loss. 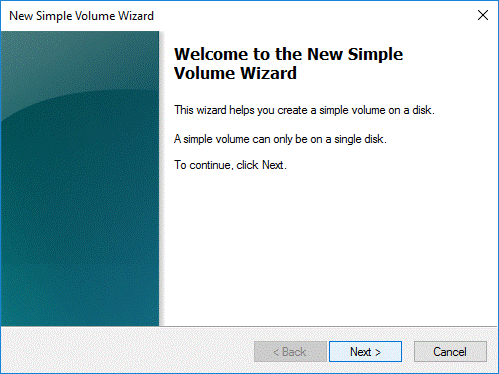 Step 3 "New Simple Volume Wizard" shows up and click "Next" button to continue. Step 4 Specify partition size and click Next button. 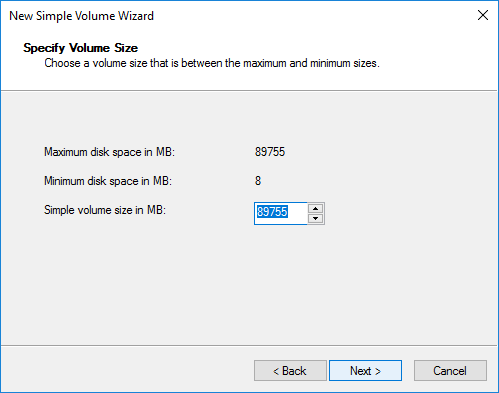 The wizard asks to enter a size for the partition and you can enter the value between the maximum and minimum available free space. Please note the value here is in megabytes instead of gigabytes. Step 5 Assign a drive letter or path for the partition you are creating and click Next. 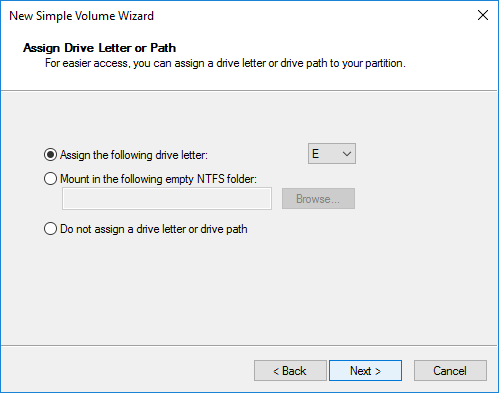 There are three options available here: Assign the follow drive letter, Mount in the following empty NTFS folder, and Do not assign a drive letter or drive path. The default selection is "Assign the follow drive letter" with a selected drive letter, so that the partition can be access in File Explorer. If you do not have special requirements or do not have idea on these options, follow the default setting and click Next. Step 6 Choose whether to format the partition and click Next. On this step you need to choose how to format the partition. A new partition should be formatted before it can be used to store data. You can choose file system types from NTFS, exFAT and FAT32. The default and preferred file system for hard drive or external hard drive is NTFS in Windows in order to guarantee performance and security. If you want to create ext4, ext3 or ext2 Linux partition, you can use DiskGenius to do the task. Formatting the partition is a better choice. 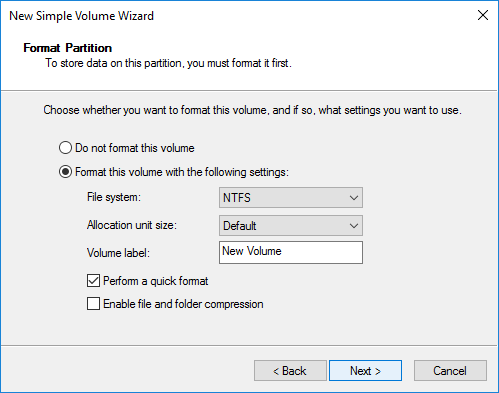 Choose NTFS as the file system and select Default for Allocation unit size. It is also advised to set a volume name so that the partition can be recognized more easily, as it is displayed in File Explorer next to drive letter. The next wizard makes a summary of setting you’ve chosen in previous steps. Click Finish button to complete the process. When the wizard is closed, you turn to Disk Management window again and the new partition will be formatted automatically. Formatting process will complete in a couple of seconds, after which the partition will be listed with other partitions. "You cannot create a new volume in this unallocated space because the disk already contains the maximum number of partitions." "The operation you selected will convert the selected basic disk(s) to dynamic disk(s). If you convert the disk(s) to dynamic, you will not be able to start installed operating systems from any volume on the disk(s) (except the current boot volume). Are you sure you want to continue?" How to make partition in Windows 7 without converting disk to dynamic? It is recommended to use DiskGenius to create new partition. DiskGenius is able to convert primary partition to logical partition without data loss, allocate free disk space to existing partition without disturbing data, etc. With this tool, you’ll have multiple solutions to make full use of disk space. 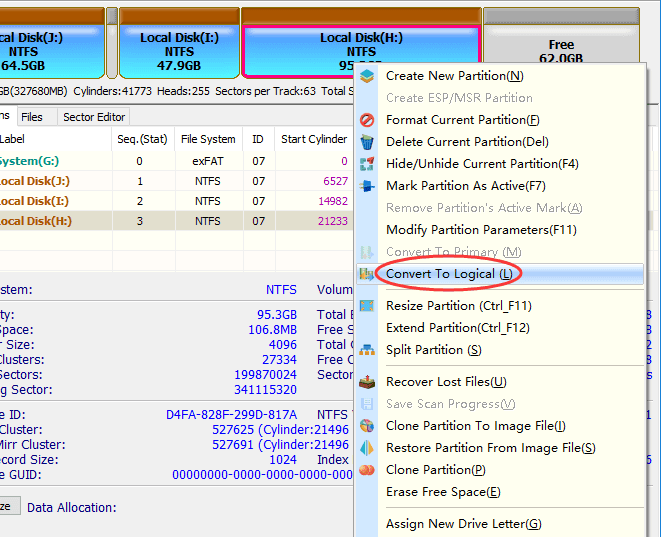 Step 1 Convert two primary partitions to logical partitions without losing data. Right-click on primary partition and select Convert To Logical, as below; perform same operation on another primary partition; then click Save All button to save changed on partition table. The converting does not cause data loss. 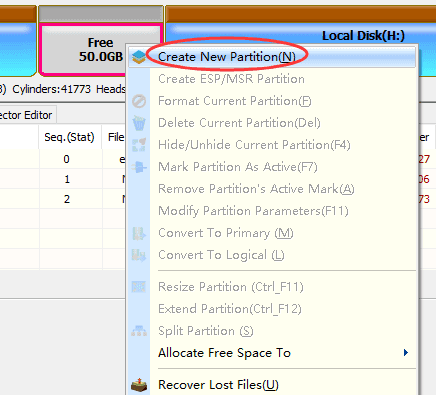 Step 2 Select free disk space and click New Partition button. Then select partition type, file system type, partition size and click OK button. Step 3 Click Save All partition and DiskGenius formats the new partition. Once the partition is formatted, you can access it and store data. Till now, you can create new partition from free disk space without data loss even though there are already 4 primary partitions (or three primary partitions and one extended partition). Another way to deal with unallocated disk space is to allocate it any existing partition: right-click on free disk space and choose Allocate Free Space To, and you can select a partition to merge the free space. DiskGenius Free is able to make partition in Windows without data loss when the disk does not have any free space. That is to say, you can use this tool to increase partition without deleting any data or partition. Let’s see how to make partition in Windows 7, Windows 8 or Windows 10 with DiskGenius Free. 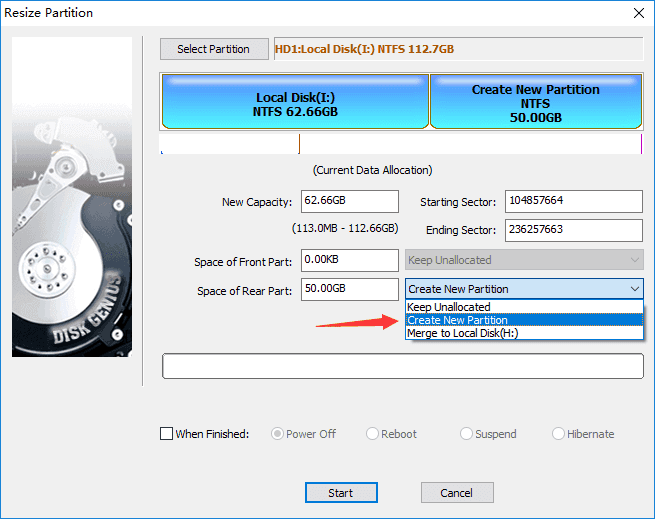 Step 2 Set partition size and select "Create New Partition" from dropdown list. Then click Start button. Step 3 DiskGenius lists operations to be done and things you should pay attention to. Click Yes to continue. Wait for a while and the new partition will be created. Apart from NTFS, exFAT and FAT partition, DiskGenius is also able to make and access Linux partition. Ext4, ext3 or ext2 partition is not supported by Windows, and it cannot be created or managed by Windows Disk Management or DiskPart utility. However, many users would like to dual boot computer with Windows and Linux systems, thus a Linux partition will be necessary. 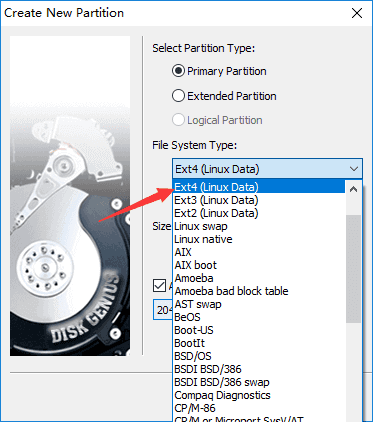 How to create, format or manage ext4 partition in Windows? 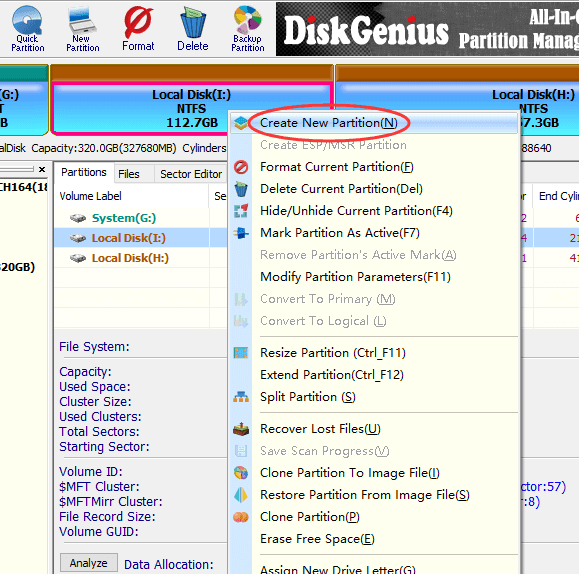 Step 1 Right-click on free disk space from DiskGenius and choose Create New Partition option. Step 2 Set files system and click OK button. There are quite a few file system types available in the software and you can choose the file system type you need, such as Ext4, Ext3, Ext2, etc. Step 3 Click Save All button and click Yes from pop-up message box. Then the newly created partition will be formatted. 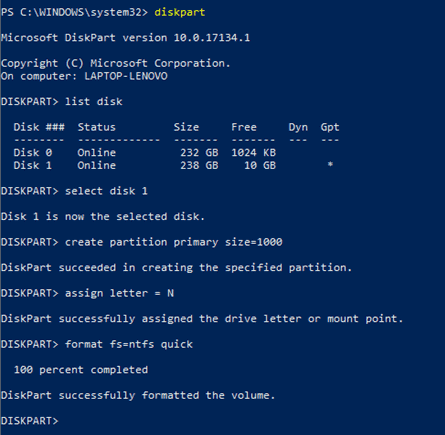 If you prefer the command line instead of easier methods mentioned above, you can try diskpart in Command Prompt (or PowerShell in Windows 10). Here is how to make partition via Windows command line. Step 2 Type following commands and press Enter key after each command. Step 3 Close PowerShell and you can open File Explorer to use the new partition. To draw a conclusion, this guide presents how to make a partition in Windows 7/8/10 no matter whether there is free space on the hard drive. This instruction includes 3 methods and you can use any based on actual requirement and personal preference. DiskGenius is much more effective when creating partition or managing disk space and it helps keep your PC/server running at its best. Pease feel free to leave a comment or contact our support team if you have any question or suggestion on the product. DiskGenius - Top partition manager to partition HDD, resize partition, recover data, clone disk, etc.